In this post we will talk about supporting multiple themes in Android application. This image show different style tags and meaning for Android 5.+. Firstly need to add dependency for build.grade file in our project. For support changing background theme for Android version less 5 we can add own attribute called “backgroundColor” for it need to add file attrs.xml to /res/values. Next step is create different themes. For it we can use styles.xml or themes.xml files. In this case I used to steles.xml file. After it need to add all colors to colors.xml file (/res/values/). Next step is update layout for MainActivity. In my case it’s a activity_main.xml (/res/layout/). When we used tag android:background=”?attr/backgroundColor” it’s our own tag, which we created in attrs.xml file. This tag depends of theme which active right now. Our theme must saved after close app. For we will use SharedPreferences. I created class called Utility.java which contain next code. For correct work this class need to add string constant to strings.xml file (/res/values/). We can check and update theme in our MainActivity, but better way is create BaseActivity, which will check and init our theme for activity. We must extend Main Activity from BaseActivity and add listeners to click button for change theme and recreate activity. Full source code you can find here. how can i download this code ..? Unfortunately, right now all code just in article. However, if you need it, yet. I can share it. Please let me know if you need it right now. I need to download above source code, please share it. Just as a side note. 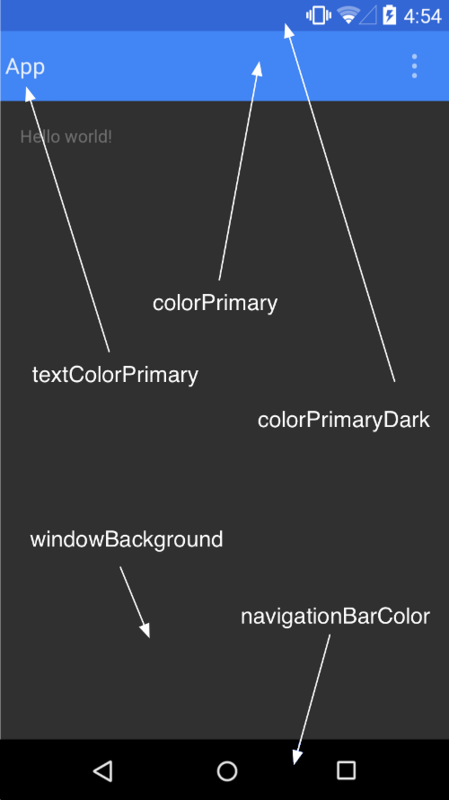 Applying a theme runtime will cause android to recursively apply and override style attributes. This is fine, but it consumes memory. I had quite some out of memory reports coming in from ancient devices. the default activity is just a loader activity. its checks which theme is stored in the sharedpreferences. ActivityB is identical to ActivityA (just an extension) With the difference that inside the manifest.xml you define the themes for both Activities. I know its not so elegant, but if you ever run into similar issues as what i have you can try this option. Thank you very much.The code is very easy to understand and useful. also very effective. Thank you for this simple example. One question though when using lighter colours for the appbar, the text is white and not very readable. How and where would I use primaryTextColor to change this. I have tried several ways and I cannot seem to get this aspect of the them to work correctly.